Modern quilt - twin sized -"Desert Quilt"
Announcement I love to create and this shop has had so mane different types of products over the years... These days, you'll find mostly quilts and mixed media collages. Some of the higher end or art quilts are entirely quilted by hand or have a combination of hand and machine quilting. Some are mounted on panel board and meant to hang as paintings and some of the simpler ones just want to be snuggled, used and taken to concerts in the park or wrapped around your loved ones. It is my firm belief that quilts are meant to be used. If you intend to use it as a quilt - feel free to wash it, dry it, stain it, love it, and enjoy it. Cotton only gets softer over time. Also available in the ART section of my shop are pieces of my fine art - mixed media paintings and collages that I have made as I have chronicled my journey as an artist and human being. These pieces come from my heart and I would love nothing more than to send them off to you to enjoy in your own space and home. I love to create and this shop has had so mane different types of products over the years... 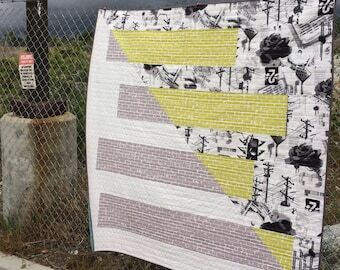 These days, you'll find mostly quilts and mixed media collages. Modern quilt Twin bed sized "green ribbons"
Quilt - small throw size. "Baby stars"
Mixed media iriginal collage art 9"x9" collage. "voices of others like me"
This is even cuter in person. It is the perfect bag! I love the size, the pockets and how sturdy it is. Love this! I just love these skirts and I am so glad that I was able to get one of the last ones. Thank you! Not a great transaction, but she tried to make it right.